bartlett mitchell scored a hat-trick of awards at the prestigious ‘Foodservice Cateys’ held at the Park Plaza Westminster last week. 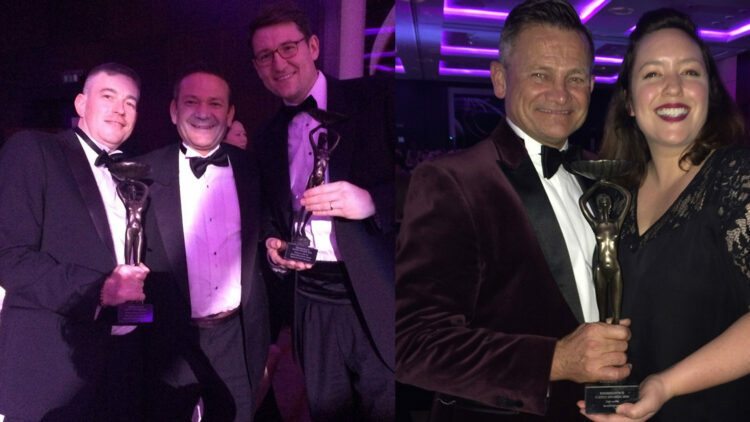 The ‘Foodservice Cateys’ awards, which included a ‘CSR’ Award, ‘Salesperson of the Year’ and ‘Catering Manager of the Year’ were presented to the team in front of hundreds of high-profile attendees from across the industry. Voted for by peers, and arranged via The Caterer, an industry leading magazine, the awards recognise excellence from across the UK and Ireland’s foodservice sector. Simon Houston, who picked up the ‘Salesperson of the Year’ award was commended for his contribution to bartlett mitchell’s success beyond business development. This included his commitment to developing new food and drink concepts such as Perkee, bartlett mitchell’s first Fairtrade sustainable coffee. Murray Soper picked up the ‘Catering Manager of the Year’ award. Murray was singled out for his inspirational leadership which has resulted in contract retention and record breaking sales and increased customer loyalty. Hannah Carmichael, Sally Grimes and Steve Fox who secured the ‘CSR Award’, were praised for their sustainable innovation, as well as driving the initative to sell Thirsty Planet water. As a result bartlett mitchell have funded 40 water pumps to allow over 4,000 people in Malawi to now drink clean water. The awards follow another successful year for the business which has seen them achieve sales growth of £11m. Photo: Murray Soper (Catering Manager of the Year award), Ian Thomas (CEO), Simon Houston (Salesperson of the Year), Steve Fox and Hannah Carmichael (CSR Award). To find out how we could develop your catering team in to award winners contact us.